TAIPEI, TAIWAN--(Marketwired - Sep 11, 2017) - New Garden, the leading cross chipset platform Wi-Fi Mesh solution provider, announced the "WiFigarden" Wi-Fi mesh system is ready on Ubee Interactive DOCSIS 3.1 cable modems. The leading solution will deliver various carrier-grade DOCSIS 3.1 whole-home Wi-Fi solutions to service providers worldwide starting from year 2018. New Garden plans to enable Whole-Home Wi-Fi collaboration on Ubee Interactive products including solutions across Wi-Fi access point, DOCSIS3.1/3.0 Cable Gateway, DSL Gateway and Wi-Fi Repeaters. Building such solutions will "enhance" users' experience on Whole Home Wi-Fi ecosystem, New Garden Sales VP Patrick Chen said, with Ubee Interactive choosing New Garden as a "strategic partner" for its Whole-Home Wi-Fi system due to its cross-chipset supporting. "WiFigarden SDK provides comprehensive cross-chipset supporting, which gives more flexibility on our product roadmap and planning," Ubee Interactive said. The WiFigarden SDK not only speeds up manufacturers' time to market for Wi-Fi Mesh products, it also handles the performance, interoperability, and scalability. Ubee Interactive will benefit from WiFigarden technology to improve the Home Wi-Fi networks to expand coverage, optimize performance and to satisfy mass deployment of operators and Internet Service Providers (ISPs). Compared to traditional Wi-Fi, which depends on one single Access Points (APs), Wi-Fi Mesh networks use multiple Wi-Fi nodes to create whole-home network coverage with advanced performance. The UBC1303 Extreme Wireless Voice Gateway is recent addition to Ubee's growing portfolio of next generation DOCSIS 3.1 gateways. EuroDOCSIS 3.1, 3.0 and EuroPacketCable 1.0/1.5/2.0 compliant, the UBC1303 delivers multi-gigabit speeds over existing hybrid fiber coax networks. It integrated 5 products into a single device: a cable modem, a residential gateway with built-in 4-port gigabit Ethernet switch, an 802.11ac dual-band concurrent Wi-Fi access point, a multimedia terminal adapter for telephony and a Wi-Fi Mesh Controller. It can support up to 8 UBH1706, an 802.11ac dual-band concurrent Wi-Fi node to provide an intelligent whole-home Wi-Fi system. Moving forward, New Garden is developing a leading Wi-Fi Mesh Solution for Ubee Interactive and Internet Service Providers worldwide who are deploying DOCSIS 3.0 and DOCSIS 3.1, and which will be published in Q4 2017. WiFigarden technology provides a solution that turns gateways or set-up boxes into Wi-Fi Mesh nodes, and the cross-chipset interoperability breaks the limitation of IC solutions, saves time, effort, money, and of course, gets connected easier with powerful coverage. These include Client and Band Steering technology to ensure devices always connect to the best available node and frequency band (2.4GHz or 5GHz) based on real-time network usage. 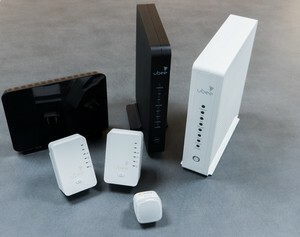 New Garden’s WiFigarden SDK will be used by Ubee Interactive to help develop a series of Whole Home Wi-Fi solutions.